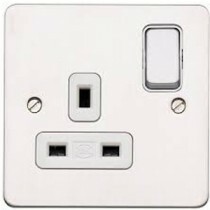 Edge is a range of wiring devices that combine function and style. The products are very slim, just 1.5mm with matching flat head screws throughout. An impressive yet subtle statement, available in an unrivalled range of finishes, Edge is the choice in modern, contemporary or traditional interiors where style and detail are the desired effect. In addition to the wide choice of standard finishes, a custom design service gives designers the ability to match almost any RAL colour required. With Edge comes unrivalled safety. Utilising MK’s 3-pin operated safety shutter, that prevents misuse and unsafe access to live circuitry, Edge offers the user the peace of mind and comfort that they have the safest range of wiring devices available installed in their surroundings.